SkyDork was in Chicago tonight, and of course he waited till 3pm yesterday to tell me about it. Unable to go see my friend, I'm posting this in his honor. This was sent out the day after the Bears got destroyed in the SuperBowl. So hold nothing back, lets hear your best caption for the picture. All entries will be forwarded on to Lee. posted by Kuflax @ 9:45 PM 7 Whatcha' Gots To Say? Thinking his team has one, a Northwest pilot is given the assignment of flying the alternate winner's jersey's to Africa to clothe the poor there. 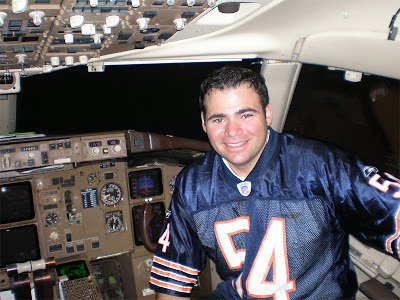 "Good thing I wore my Bears jersey when I flew my plane to Chicago. Now people will like me. However, I forgot to turn the lights on outside; it might help"
"Somehow wearing the Bears jersey didn't stop the young pilot from being gay. If anything it made matters worse." What is more frightening, seeing this guy in the cockpit or having Rex as the quarterback of your team? "Got any 40 yr old flight attendants lying around???" No witty caption from me, just want Nort and Will to know they make me laugh...... Sorry Skydork, it appears to be at your expense. It was nice to see you at the wedding, though! I'd just like to say that my God awful spelling is due to the fact that I wrote that comment about 15 minutes after I woke up.